Headsweats today announced their exclusive agreement with VERSUS, the fastest growing sports cable network in the country and the exclusive television home of the Tour de France in the U.S., to sponsor Bob Roll's Ask Bobke segments featured on the network during the 2010 Tour de France. This is Headsweats second year as the official headwear for the legendary international cycling race that runs for three weeks every July and spanning a total distance of over 2,200 miles. Bob Roll, the well-known former professional American cyclist, is part of VERSUS' Tour de France on-air announce team and the Ask Bobke segment has been part of the network's coverage since 2004. "Sponsoring Ask Bobke was an obvious step in our support of the Tour and a solid way to augment Headsweats' brand recognition within the cycling market," says Alan Romick, Headsweats founder and avid cyclist. "Roll is legendary to the sport and provides Tour followers with a colorful, yet honest and direct assessment of the race." Ask Bobke will air during the network's primetime show which airs from 8-11 p.m. ET each night throughout the Tour. Online coverage will include a pre-Tour eBlast to cycling fans, with Ask Bobke information and details about winning a Bob Roll inspired, limited edition TDF collection hat. 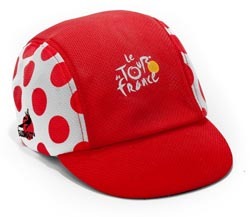 Continuing as an Official Tour de France Product supplier, Headsweats will include their Spin Cycle hats within the TDF custom collection for 2010. This classic cycling cap is available with Tour sublimation and colors. It features a COOLMAX® outer shell for maximum moisture management and an elasticized back and soft bill for enhanced comfort and fit. The complete Tour de France collection can be previewed online at www.headsweats.com. Beginning July 3, fans will be able to log onto the custom Ask Bobke micro site on VERSUS.com, www.versus.com/headsweats to submit their questions and for a chance to win Headsweats products. Everyone seems to have an opinion on the most unorthodox member of VERSUS' team of cycling commentators. From poking fun at cycling fans to his one of a kind "Roll-isms," Bob Roll has an unforgettable personality and intense passion for cycling which he always brings to his coverage of VERSUS' cycling. Bob Roll is a cycling pioneer with five Tour de France competitions under his belt.